Today we started out slow. Slept in and took our time getting out of the house. 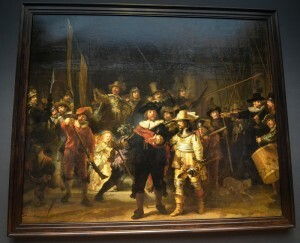 First stop the Rijksmuseum to see some art work. We took the metro train this time into Amsterdam. This is much faster then the bus. A little more expensive but worth it. One ticket was $7.50 Euros each, but it lasts all day and as many changes as you need. It also works for the tram and the train. The Rijksmuseum was a very big place. It would take all day to go through all of it so we toured a couple of floors and spent about 1.5 hours there. 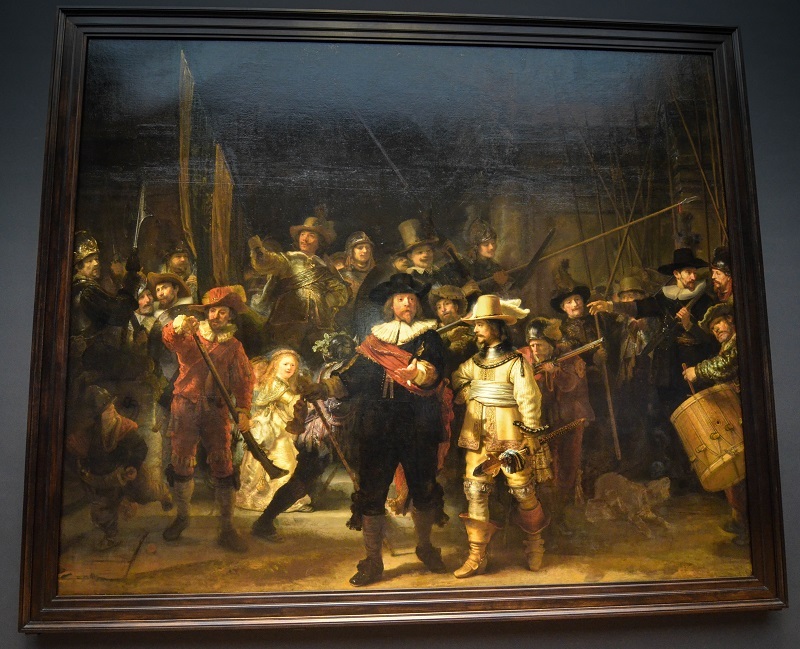 Of course the main attraction there is probably “The Night Watch“, painted in 1682 by Rembrandt Harmenszoon van Rijn. The painting is approximately 12 x 14.5 feet. Rembrandt was paid 1,600 guilders for the piece; about $950 Canadian dollars which was a lot for the time. There is no value given to it now as there is no “market” for it as it will never be sold but some claim a value of $305,000,000.00. 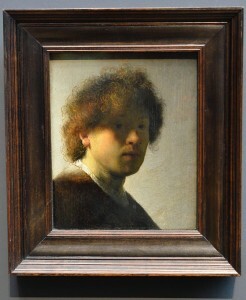 It is owned by the the City of Amsterdam and is on permanent loan to the Rijksmuseum. 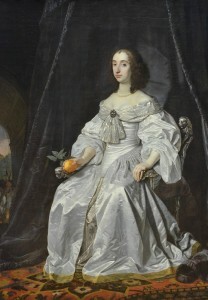 The actual title of the painting is “The Company of Frans Banning Coqc and Willem van Ruytenburch”. Now on to the next attraction of the day……The Pride Parade Amsterdam style!! We walked about 2 blocks from the museum to the main canal where the 79 floats (boats) were making their way through the canal for the Gay Pride Parade. 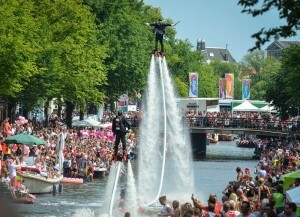 It is a very busy weekend here with events happening all over Amsterdam for the pride weekend. 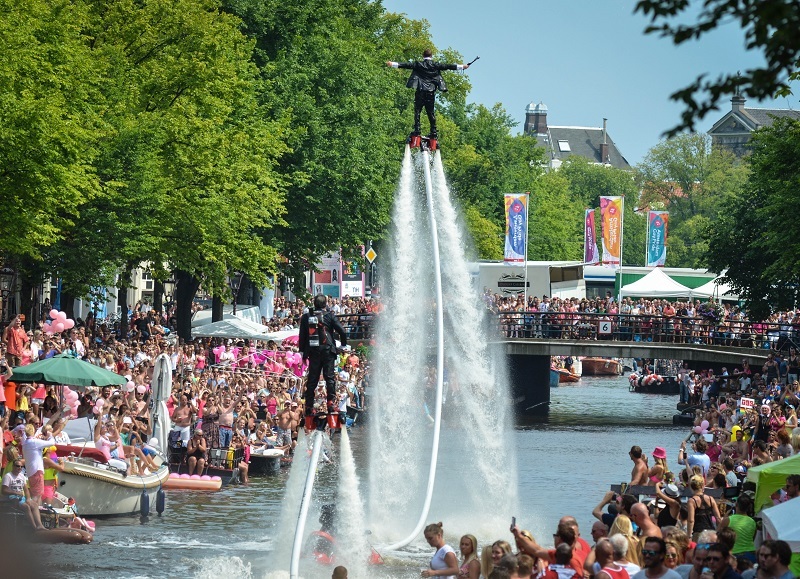 We wanted to see the parade through the canal…..along with another 500,000 people or more. It was CRAZY! Wow….what a party. So many people, music, ticker tape, balloons, flags and cheering. It’s really a sight to see. I didn’t have the advantage of being tall so I say only bits and pieces of the floats through the people lining the canals. The parade started at 1:30pm and they say to get there early if you want a good spot. We were definitely late. I just held my camera up and hoped for the best. It was a lot of fun. The atmosphere is very uplifting and many very happy people. We saw people viewing from the roof tops and at every high vantage point they could find. On home again to have dinner with Ferlins family and relax for tomorrows big day on the boat. We are spending the day roaming the canals on Marlon’s (Ray’s Cousin) boat with the whole family. It is supposed to be a 8-10 hour day. We get to see Holland from a different view.